Written by: Nick Arrietta on July 2, 2010. Way back in the year 1969, Ampeg teamed up with guitar extraordinaire Dan Armstrong with the idea that they wanted to create an electric guitar like no other. Well they did! The work resulted in a guitar that was way ahead of its time… and transparent! The first impression I had was… hey look, a plexiglass guitar?! It’s time to jam! Like the newer Ampeg guitars, the cool thing about these guitars are the interchangeable pickups, awesome! The pickups include a single-blade pickup and a dual-blade Sustain pickup. The pickups are supported tonally by a rosewood bridge with compensated brass saddles and a hard maple neck. Surprisingly, the tone is pretty good, nothing like all wood bodies but very doable. Overall, this guitar is a great sounding axe. The tone can go from thin and trebly, to thick and chunky. 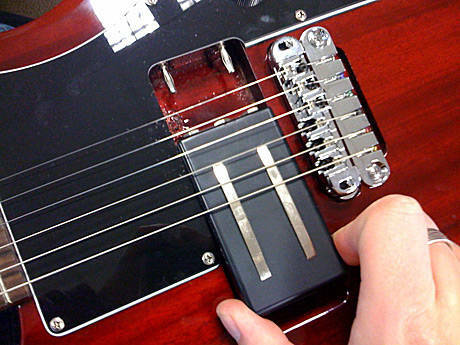 The Grover tuners keep the Plexi model guitar in tune perfectly, even through heavy jamming. It’s kind of heavy for my taste, but still lighter then a les Paul. The maple neck is smooth and fast, letting you glide over the 24 frets effortlessly. If you are in the market for a different type of guitar the Ampeg Dan Armstrong Plexi is for you. Pros: Different, 24 frets, fast neck, interchangeable pickups. Till next week, thanks for reading and keep on shredding!